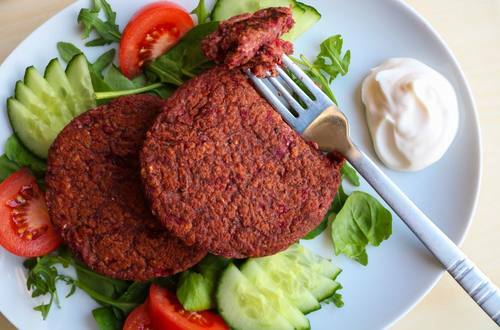 These veggie powered vegan Sweet potato, Quinoa and Black Bean Burgers are the perfect energy boosting lunch! Recipe and imagery development courtesy of Phitzee. 1 Prepare burger ingredients by cooking the sweet potatoes, black beans and quinoa. 2 Add all the burger ingredients and seasonings into a food processor/blender and pulse until there is a fairly smooth consistency. Having a few rough bits in there will add to the texture. 3 Once your mix is ready, share into burger sized patties (makes 6 large patties or 10 medium sized patties). 4 Lastly, fry the patties on a medium heat for 1-2 minutes on each side in a lightly coated pan. Serve with a dollop of Hellmann's Vegan Mayo.